Summary: Fort Lauderdale's beaches are home to hundreds of nesting sea turtles each year, with over 400 nests located just in the past year. The City also maintains seven miles of public beaches, visited year-round by thousands of residents and tourists. In an effort to balance the management of the beach with the responsibility to protect sea turtles, the City of Fort Lauderdale will undertake it's first educational program, utilizing a multi-faceted approach to increase public understanding of these threatened and endangered animals. This project will develop and produce a permanent regulatory signage that promote the understanding of the biology, life history, threats and habitat needs of the marine turtles that nest on Fort Lauderdale's beach. Results: The intention of this project is to better educate the citizenry as well as visitors of the importance of conservation of the marine turtles and their habitat. 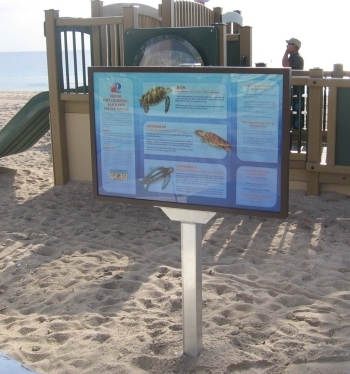 The signage that was developed and installed is attractive and colorful which draws the passer-by to the invaluable information printed on the sign regarding the marine turtles, their habits as well as their status on the "endangered" list. With these signs, we feel the turtles have been given an added measure of protection due to the fact that an educated beach patron is far less likely to disturb or harm a turtle and/or its habitat. The signs will certainly be an added measure of protection for the turtles on top of our protective measures of light reduction, turtle monitoring and documentation during marine turtle nesting season, which occurs from March 1 - October 31.